Captain Joe Ryan (Bill Travers) and his partner Sam Slade (William Sylvester) are doing some salvaging when their ship runs afoul of volcano. They pull into the harbor of a small fishing village for repairs, but are treated rudely by the spooked locals. That night a giant reptilian monster rises from the ocean and attacks the village. The residents drive it away with torches. Joe gets the bright idea to capture it, and after promising to give it a university for study, he turns around and delivers it to a circus in London. It isn’t until it’s far too late that everyone discovers that the captured monster is merely a baby and mom is coming for her young. Right away, Gorgo circumvents a lot of the predictability of most kaiju films by giving us a couple of protagonists with questionable morals. They are both charming opportunists but things quickly get out of hand and we get to watch Joe and Sam’s increasing horror at what they have done. Gorgo smartly takes some dramatic cues from King Kong (1933) and places a few misguided humans against a destructive, but largely innocent beast. This really does help give the third act a note of potential tragedy as both people and monsters could suffer some losses that might have been avoided. There is no shortage of spectacle either with the monsters depicting a good blend of menace and personality (and their little flappy ears are adorable). Much of the miniature work in London is excellent and kudos to a kaiju film that doesn’t shy away from the human casualties of a giant monster attack. There are a bit too many composite shots that don’t work well, but most of these are on Joe’s ship so at least they are out of the way by the time we get to London and the real meat of the film. Bill Travers and William Sylvester both manage to walk a tightrope with their characters balancing between likable, and money hungry opportunists. Vincent Winter plays Sean, the inevitable kid who tries to befriend the monster. Although he’s nowhere as annoying as many kids in these films (i.e. nearly every kid in a Gamera movie) he doesn’t serve much of a function other than to try and evoke sympathy for Gorgo and then later be put in danger when London is getting torn to shreds. The recent VCI Blu-ray looks good. The colors are vibrant and resorted print looks clean and crisp. It feels like a wholly different film from the muddy looking version that existed for years. Gorgo also had a surprisingly prolific life in comic books after this film was released. IDW recently put out a collection of the issues drawn by Steve Ditko. 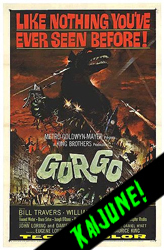 With a run time that falls just short of the 80 minute mark, Gorgo is a very lean story that keeps things interesting with a plot that is slightly more than just, “Big monster beats up major city.” I wouldn’t have minded Gorgo returning in a few sequels to smash up the Eiffel Tower or sit on Belgium. They have it coming, those bloody Belgian bastards. All smug, with their irresistible chocolate and 800 varieties of beer. Come to think of it, they spent a big chunk of the last century with a monster sitting on them, metaphorically at least. Maybe they should get a break. And yes, I did just Godwin Gorgo. Thank goodness there wasn't a trend of giving monsters names that end in -orgo. There could have been some truly painful movies made.